So yesterday at the press grand opening of Fast and Furious: Supercharged at Universal Studios Hollywood, Michele Rodriguez, one of the film series and ride's stars, let slip that F&F would be coming to both Universal planned park in Beijing as well as Florida. This really didn't tell us anything we didn't already figure, as Furious 7 has become the third highest grossing film of all time, though that's soon to change to 4th thanks to Jurassic World's monstrous success. Though that's a story for a different time, I'm sure. What her comments have sparked, however, is a discussion on just what the heck the ride will be when it comes to Orlando. The new capper to the Universal Hollywood Tour clearly won't be ported directly to the other parks, especially if Beijing's helping to foot the R&D bill of a stand alone version. Plus, the attraction has garnered lukewarm reactions from fans, and the story is custom made for the tram tour. On top of all that, Universal's recent track record shows that the second version of an attraction is nearly always significantly better. Springfield, Kong, Potter, and Despicable Me have all been significantly plussed in their second iterations. So, what the heck is coming here? Allow me, if you will, to take you through what I've worked out. But before I get to it, let me warn you. For the record, the only thing I'm semi-sure of in the following hypothesis is the project number, and until permits show up I don't even know if that is 100% right. So take the following with a grain of salt, or more depending on how much you trust me. Let's get to it, then. Project 620. That's basically what my theory hinges on. From what I understand that is the project number for the Fast and Furious Orlando project, and I've seen others agree. I know the project number exists thanks to luck, for the most part. When Googling "Universal Orlando Project #" just for fun, I came across a LinkedIn profile that had two project numbers on it: 727 and 620. 727, as we've said before, is supposedly the long-rumored Tonight Show attraction replacing Twister, and as I said, 620 is believed to be Fast and Furious for USF. "So what?" you're probably asking. "A project number doesn't tell you anything." And honestly, you'd be completely justified in that. It's what comes directly below that which sparked my interest. The same person working the lead on Project 620, believed to be F&F, was also the director of ride and show during Universal Moscow's planning. Again, what's the big deal about that? 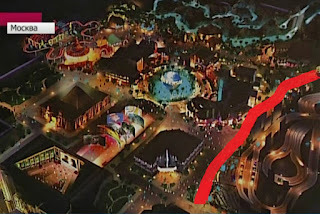 Well, if you don't remember the concept art for Moscow (and let's be honest, it seems like the park vanished quickly so I wouldn't blame you), let's take a look. The red outline is my own doing, obviously. And what is it outlining, exactly? Well, it certainly looks like a racing-type ride, more than likely centered on the F&F franchise. So that's my hypothesis. The ride that was being planned for Universal Moscow will be the basis for the ride coming to Universal Beijing and Universal Studios Florida. My guess could be completely wrong, and maybe all the connections are just circumstantial evidence, but that's what I'm going with. If I'm right, I'm genuinely excited to see this. It would be a departure from Universal's recent rides (though I still expect screens depicting the movie cast to be included), and would be a legitimate E-ticket experience. So what do you think? Let me know in the comments or @Parkscope. And, as always, ride or die.